This amazing shot depicting night operations aboard the USS Boxer showcases the MV-22’s unique “proprotor” configuration in spectacular fashion. 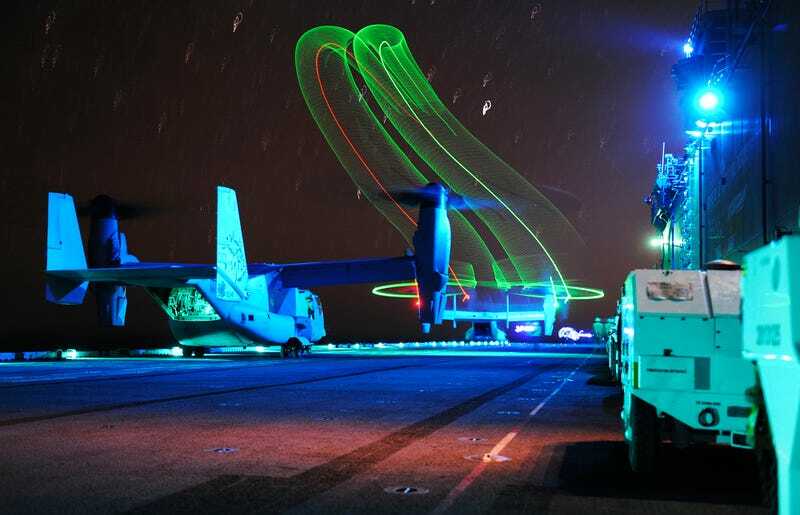 The long exposure time allows us to see the Osprey transfer from near vertical to forward flight, with giant slinky-like tubes of light tracing its departure. The Boxer Amphibious Ready Group (ARG) is undergoing training certification off the California coast for an upcoming deployment to the Middle East. Last week, the USS New Orleans, an integral player in the Boxer ARG’s flotilla, experienced a mishap when a Osprey full of people landed short while attempting to board the ship, its rear wheels hanging precariously off the edge of the ship’s deck. Although the Osprey has had a decades long and often troubled development, and it costs approximately three times that of a similarly equipped helicopter, the Marines have stood by the type. It is now the backbone of the USMC vertical-lift fleet with close to 275 examples of the type having been delivered. The Air Force Special Operations Command also flies the type, with 50 units planned, and the Navy has recently announced it will be buying the Osprey to replace the venerable Grumman C-2 Greyhound for carrier onboard delivery duties. Japan is the first export customer of the type with 17 on order. As the Osprey production program for the USMC enters its golden years, the Marines will turn toward spinning up production on the CH-53K King Stallion, the evolutionary replacement for the heavy-lifting CH-53E Super Stallion. The King Stallion has just entered flight testing, with hopes that the helicopter will be operational by the end of the decade.